Hi friends! So I’ve been working on a pretty epic planner-related list for you. 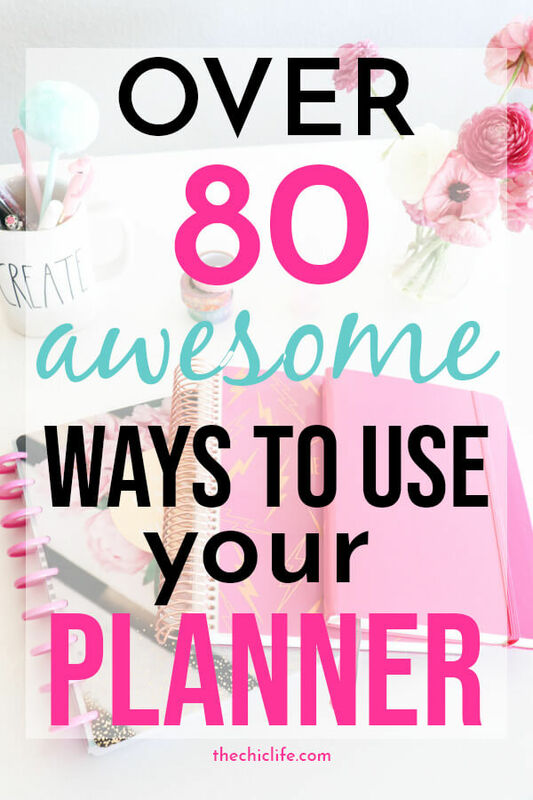 Today I’m sharing 80+ Best Ways to Use Your Planner. That’s right – over 80 ways! And I will continue adding to this list as I discover new ways to use and organize your planner to make the most of it! Meeting friends: Who doesn’t love friend-dates!? It’s always a good idea to meet up with your friends for fun outings and what not. I especially like to use silverware icon stickers like this pastel set to track dinner dates with friends. Family time: Family dinners, outings, and what not are great to track. Special Events (Concerts, conferences etc. ): That Beyoncé concert coming up in 6 months? You’re all over it! Oh, and the blog conference is in the books too. Woop! Appointments: Better not forget the dentist. That will be nearly impossible to re-book. Also add in doctors and other important appointments. Like getting your hair did. Annual Special Dates (birthdays, anniversaries, etc. ): Remember your loved ones birthdays so you can send birthday cards and congratulatory texts. Volunteering: Since it’s important to give back, make time in your schedule and space in your planner for volunteer activities. Dates: Whether it’s a new date or a date with your significant other, dates are fun to schedule and give you something to look forward to. To-Do Lists: Use your planner to make your everyday lists of what needs to be done by day, week, and month. And even year! Weather: Track the daily weather by drawing weather-related graphics, using stickers, or even just writing in temps (highs, lows, and what not). Travel Dates: Enter the dates of your upcoming travel, whether it’s for play, work, or both! Flight Details: Booked your flight? Good idea to note the travel details here for quick reference. You could use these pastel airplane icon stickers for flights. Hotel Details: Same with hotel. Car Rental Details: And car rental! These pretty pastel car stickers would be fun to use for this. Travel Preparation: Use your planner to prepare for your upcoming trip. Plan ahead what you need to do ahead of your trip – things to buy, day to pack, etc. I also like to add things like charging camera batteries and other preparatory to-dos. Packing List: Write up your packing list, or even make note of key items that you simply must bring. Places to see/visit (on your trip): Make a list of your must-see tourist attractions, restaurants, and other things you really want to do on your trip. Vacation Countdown: Count down the days to your trip by writing in the days left or using a cute vacation count down sticker set. Places to see/visit (future): Make a list of places you hope to visit later in the year or even a bucket list of places to go one day. No time like the present to start manifesting that! Workout Schedule: Plan out your ideal workout routine and schedule so it’s easier to stick to your goals. Workout Plan: Add in your workout plan – workout durations, sets, etc. Steps: Track how many steps you’re getting each day. Rest Days: Don’t forget to make time for rest days. I love ensuring I have simple down time or even booking restorative yoga classes and meditation sessions on these days. Calories burned / stats: Track your stats for the day – how many calories you burned, heart rate, and other workout related stats are great to write down in your planner. Breakfast: Whether you’re doing meal planning or keeping a food diary, you can easily track what you ate for breakfast. I love these pastel silverware stickers for food/meal tracking. Dessert: And let’s not forget dessert. Calorie / Macro Counting: Counting calories or macros? You can track that here too. Recipes Tried / Rating: And you can add to your daily planner or even make a whole list on a blank page to note which recipes you’ve tried and give them a rating. That way you know which ones to keep on repeat or skip next time. Work Schedule: Track what time you’re in and out for work. Meetings: Add in your meetings for the day or highlight if there are certain high priority meetings you need to take care of. Important Dates: You can also add special dates, like project go-lives, schedule changes, when you have to work late, or other dates to note. Pay Day: Who doesn’t love to get paid? Track when your paychecks are coming. Working for yourself? You can note when you have money coming in. Days Off (Vacation/Holidays): And some of the best days to track – work vacation and work holidays. Class Schedule: You can add in your regular class schedule so you don’t make your professors upset by accidentally missing class or showing up late. Assignments: Take note of assignments so you can plan how to get them done. Studying sessions: Plan out study sessions with your classmates or for yourself. Grades: And if you want, you can also write down your grades – by assignment, test, and/or class. Quotes: Quotes are one of my favorite things to add! I especially love the gorgeous quote stickers you can find in the Happy Planner sticker books, like this one. Inspiring photos/graphics: You can also cut out motivation graphics from magazines, etc. and glue those into your planner. Add inspiration planner stickers an what not. Goals: Write down your goals for the day, week, month, and year. New Year’s Resolutions: Add your New Year’s Resolutions – these are fun to note at the beginning of the year and then review at the end to see how you did. You can also use this list to track progress throughout the year. Shopping Spends: Track your shopping habits. No Spend Days: Shoot for no-spend days or add a habit tracker if you want to do this for a period of time. Budget: Note your budget – planned and actuals. Bills Due (Once, Recurring): Track your bills – whether they’re one time or recurring. Savings: Manage your savings and savings goals. Online Order Tracking: Add info to track online orders. Gifts: Track amounts and plans for gift giving. Podcasts: Note podcasts you’re listening to and track when new episodes will be released. Book List: Keep a b0ok list or track your book reading progress. Make a habit tracker for daily reading. I also like to add in quotes from books that touch me. Movie List: Write down a list of movies you’re currently watching. TV List: Same with TV shows. These pretty pastel TV icon stickers make show tracking fun. Netflix List: Same with Netflix list. Music / Listening To: Make a list of songs you’re jamming to right now. These are fun to look at later. Other reading (magazines, online): You can also track other things you’re reading, from magazines to digital platforms. Cleaning Schedule: Make a cleaning schedule you can stick to. Groceries List: Track groceries you plan to buy. Make a need-to-restock list. Plant care: Schedule out how you want to take care of your houseplants. Not sure about you, but this can be easy to forget! Planning Time: Ensure you’re using your planner on a regular basis by setting up a schedule to set up and use your planner. There are lots of fun planning time stickers online. Happy Mail: Placed an order for cute planner supplies? Track your delivery dates and what not for your Happy Mail. Mood: Set up a mood tracker and add fun colors and designs to keep it interesting. Hydration: Add in hydration tracking. This one is super popular in many planner spreads I see. And a personal favorite of mine. Vitamin: Set up a habit tracker for taking your vitamins. Time of the month (ladies? ): Track your time of the month. There are some surprisingly cute stickers for this on Etsy. Ovulation Schedule: Ready to make some babies? You can also track your ovulation schedule. Vision Board: use a blank page or spread to set up a vision board for the month or year. Affirmations: write down affirmations you want to use or select one for the day. Gratitude: Keep a gratitude journal for one thing per day or week. Daily Review: Make time for self-reflection and add notes for how you / your projects are doing by day. Weekly Review: Also by week. Monthly Review: Also by month. Yearly Review: And of course by year. School / Kid activities: Track your kids’ activities and school events. Parent-teacher day? Field day! And all that fun stuff. Baby schedule (feeding, pooping, etc. ): New baby? Track all that here too – from feeding times to poop schedules. I don’t have a kid yet, but I hear this is important. Posting Schedule: Track your content posting schedule. I like to add this by the weekly and monthly spreads to see how I’m doing. Content Ideas: Brainstorm new content ideas. Stats: Track your various platform stats. Email newsletters: Note your email newsletter schedule and stats. Content Promotion: Schedule your content promotion plan. Editorial Calendar: Plan your upcoming content by using your planner as an editorial calendar. Tip: I like to use sticky notes for this so I can move ideas around based on how my actual production is coming along. Daily Content Habits Tracking: Make daily trackers so you can see how you’re doing with posting to Insta, etc. Personally, I’ve used the Erin Condren LifePlanner since 2011 and The Happy Planner since 2019. Phew! That was quite the extensive list of the many wonderful ways you can use your planner. At the start of this post, I shared over 80+ Best Ways to Use Your Planner. But who knows how many awesome ways to use and organize your planner we’ll have one day. Take note: Book mark this page, pin the graphics, share with your friends, and visit back to see what’s new! 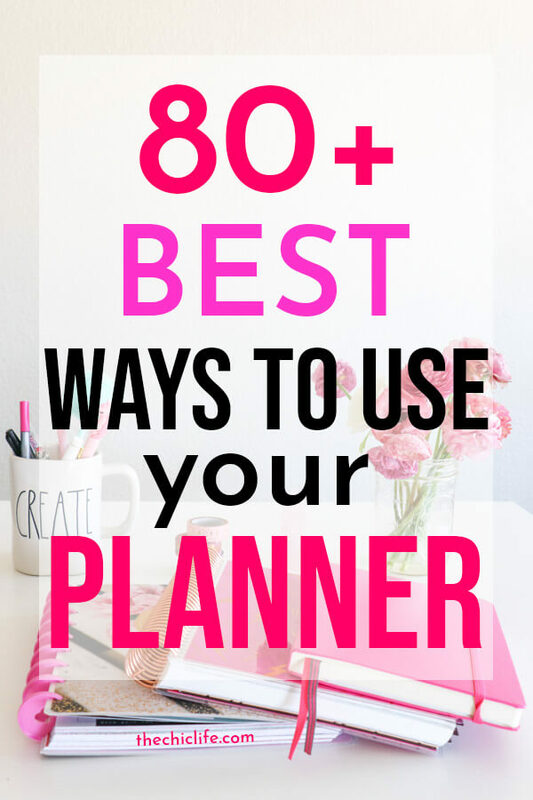 Thank you so much for reading about 80+ Best Ways to Use Your Planner. What are your favorite ways to use and organize your planner? Want to do my very 1st planner for our finances and budgeting and for also sorting out of the bills.and the budget.so we will definitely need a budget journal.